A Circus Ringmaster at your service. Please see below for information or click here to email or phone 44 (0)7875 826773 to discuss your requirements. Performs across the UK and beyond..
For illustrative purposes, new show photos to follow. This tongue in cheek circus act brings charming wit and repartee to a real impalement danger act like never before. Featuring Mr Francis (The Fearless) Maxey Esquire and Mister Pete (More Danger) Gamble, two gentlemen of this parish. present a charming tale of the origins of knife throwing in a steam powered circus, with increasingly dangerous feats of knife throwing, as the pressure builds so do the laughs, a guaranteed comedy driven steam railroad ride of delight. This unique show features never before seen stunts that will have your guests on the edge of their seats and laughing with relief. Perfect for “The Greatest Show on Earth”, Cabaret Dinner Shows and circus themed events and festivals. “The Even Deeper, Deeply Dangerous Show” (30 minutes) includes unique whip cracking stunts and thrills, with or without audience participation. Also available as a Wild West, Steam Punk and Medieval themed acts. Set up time: 40mins , target board can then be preset on stage and will be black cloth covered. Rehearsal : Required at least one hour prior to to event with lighting and sound cues. Site Visit : Always preferred ( additional costs will occur) but venue photos appreciated and dress/lighting rehearsal essential. Lighting : Flat even lighting, no follow spot to be used . Polished, professional and perfect for your event, with international award winning circus skills, world class wit and consumate charm. He has hosted international circus shows, corporate awards evenings, weddings, handfastings and starred as “Zidler” in Moulin Rouge stage productions, “Huge Jackman” for The Greatest Show on Earth” and Ringmastered for Zippo Circus, No Fit State, Pick “n” Mix Circus, Black Jam Circus and Cirque Surreal. Available as host, compere and toastmaster whether for an hour, a day or an evening. Also available with a Circus Cabaret show with whip cracking and circus skills. Radio mic required but a PPA can be available for smaller venues. Clean, secure changing space please. To learn more, call 07875 826773 0r click here to email us. Available as Victorian, Edwardian, Kabaret and Wonderland Themed. — Lisa E Events Officer Ty Hafan The Childrens' Hospice in Wales. 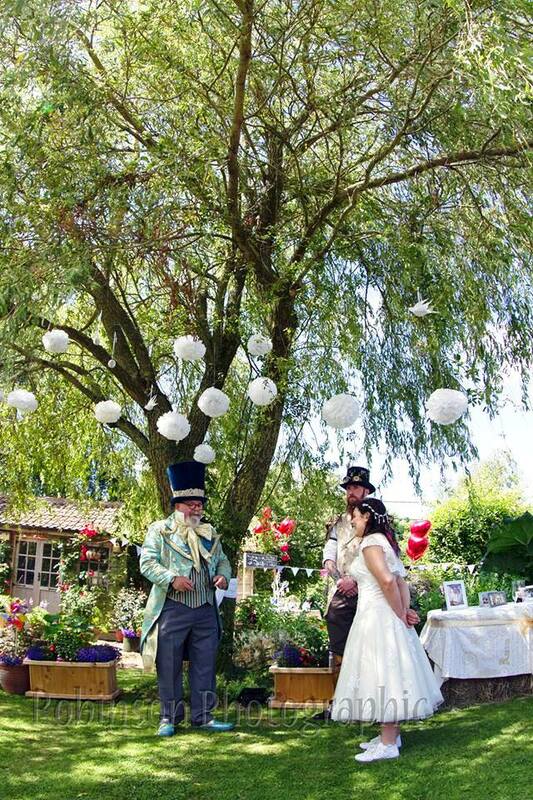 A circus wedding in the Lake District for Sarah and Trevor. When as a young girl Lizzy was asked by her Mother where she would want to be married; she replied " Underneath that willow tree in our back garden " " as a Mad Hatters Tea Party ! " 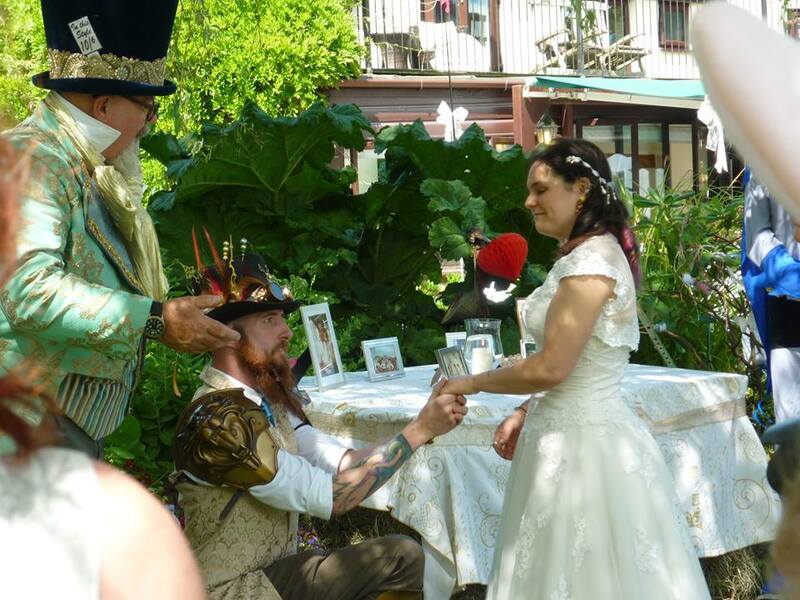 The simple answer is No, but as an experienced Hand Fasting celebrant he wll develop a personalised Circus Hand Fasting Ceremony to suit you and your event. It is non religious, more humorist than humanist and has proven to be a great success. Phone 07875 826773 to learn more or click here to send us an email . An accomplished compere, he has hosted awards ceremonies for Admiral, ING, Sony and Lloyds Bank and Gala shows for the British Juggling Convention, community circus cabarets, toastmastered for The Round Table and entertained at Royal events. With years of experience as a Hotelier, Bangueting Manager and professional ringmaster, he is a master of the moment with great presence and charm mixed with a warm wit and a wicked sense of humour. His voice was described by Gaby Roslin as “liquid gold”, if you need people moved on to dinner, warmed up for dessert, fired up for the first act, he’s the man for you. Meet and Greet, Stiltwalkers, Hula Hoop artistes and Balloon Modellers also available. Length Of Performance: , However long you need from an hour to a day and more . Rated as the Mumsnet "Best Christmas Experience in the West." New for 2019 "Charlie Christmas and the Giant Christmas Tree "
Do please contact us to check his availability. Or text or telephone 07875 826773 . South Wales based and works across the UK and beyond. Hysterical based characters... with shows to match. See below for details or click here to email or phone/text 07875 826773 to discuss your requirements. Flying Officer Kite and chums! See below for details , click here to Email or Text/Telephone 07875 826773 to discuss your requirements.